This has been a hard month for our family. Along with my surgery at the end of last month, we also had to deal with some pretty serious digestive issues in our son. To make a long story short, we spent a scary night with the 911 paramedics, the E.R. staff, and the next day (right after my surgery) at the pediatrician's. The pediatrician suspected it could be cystic fibrosis (CF). 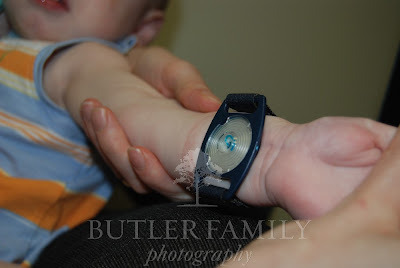 The next week we took our little boy to the lab for blood tests and to the children's hospital for a sweat test. Why sweat? People with CF have a much higher salt level than those without the disease. At the lab, they stimulate the sweat glands and then put a little collector (like a watch) on their arms. The collector dial has a chemical in it that turns the sweat blue (photo by Jacob Butler). So, we got the sweat test results last week: positive. And on Monday, the blood test confirmed it. Our baby has cystic fibrosis. Cystic fibrosis is a serious genetic disease that affects how the body produces mucus. People with CF produce unusually thick mucus that clogs vital organs, especially the pancreas and the lungs. This leads to an inability to digest and absorb nutrients, chronic lung disease, and other life-threatening complications. You can learn more about this disease at The Cystic Fibrosis Foundation. 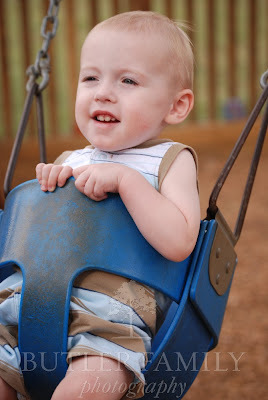 Currently, there is no cure for CF, but we have a lot of hope that in the 35 years that our son is expected to live, there will be further advances in the medical field. We fully expect our boy to live into his 40s, maybe even 50s. Perhaps new gene therapy advances will find a way to correct the altered CF gene in our son's DNA. We have been through shock, fear, anger, guilt, and depression over this past week. Fortunately, we have been surrounded by friends and church members who have given us lots of love, support, and comfort. My email inbox is full of encouraging messages from our family and friends, and we are remembered in many, many prayers. We know that our Heavenly Father is watching over our little boy, and we have a lot of faith that his life will be a full and bright one. The good news is that I am pretty much recovered from my surgery and our son has already gained a pound with the help of enzyme replacement supplements and extra calories. We will soon be doing respiratory therapy to help him loosen the mucus in his lungs and airway passages. Fortunately, CF is not contagious, nor does it affect his brain or nervous system. We do have to take precautions, though. We have to be careful around people who are sick and ask people not to smoke in areas where we take our son. Our little guy will still be able to learn, go to school, play with his friends, and grow (thanks to the enzymes he takes with every meal). We'll still be able to take him on photo shoots and have him model for two photo-crazy parents. Life has changed, but it also continues. Our days will still be filled with a talkative toddler who loves to "a swin" (swing) and blow "bub-bubs" (bubbles). And we will continue too. We will still do the best job we can raising our son, and spend lots of time laughing, and playing, and being a family. Yesterday we visited the CF specialists at Children's Healthcare of Atlanta and our little guy is finally gaining weight and growing--a pound and a half in just one month! The enzyme capsules he takes with every feeding have made a major difference in his ability to digest and absorb food. Hurray! That's the good news. The not-so-good-news is that these past few weeks have been just the tip of the iceberg of CF care. We have started two more medications and will be doing respiratory techniques everyday to help his lungs stay relatively clear of the mucus his body produces. In addition, the future cost and time commitment that CF will take is sometimes overwhelming. I'm not easily discouraged, though. After talking to the specialists yesterday, we found out that some parents of CF patients don't comply with airway clearance techniques and therapies necessary to keep their children healthy. As hard to believe as that sounds, it makes me realize that this is a choice we've made to help our son thrive and live. What a wonderful choice we have made.